It took extra innings and a quirky international rule, but the Biloxi Shuckers finally saw their six-game road winning streak come to an end Tuesday night. Matt Thaiss’ sacrifice fly brought home Riley Unroe as the Mobile BayBears were victorious, 4-3. Luis Ortiz took the loss, despite tossing 6-plus innings of outstanding relief. The Shuckers got off to a great start, plating three in the top half the first inning. Corey Ray led off with a base hit, then stole second. Mobile starter Griffin Canning struck out the next two batters but Nick Franklin kept the inning alive with a little chopper that he beat out for a base hit. With runners at first and third, Franklin broke for second. On the throw, Ray raced for the plate, stealing home for his fifth stolen base of the season. 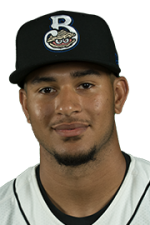 Jake Gatewood then followed with a towering blast over the wall in left-center for his second home run of the year, and it was 3-0 Biloxi. The BayBears responded with two runs in the bottom half of the inning. Brennon Lund led off the frame with a line drive into center for a double. A ground out moved him to third and Taylor Ward reached on an error to put runners at first and third. Ward was then picked off by Wade Miley, and it looked like the Biloxi starter was going to get out of the first unscathed. However, an error by shortstop Jake Hager allowed Hutton Moyer to reach and Lund to score. With new life, Michael Barash singled, putting runners at the corners and Connor Justus followed with a double into right field that brought home Moyer to make this a one run game. Justus was thrown out as he rounded second, straying a little too far, for the final out of the inning. It would remain a one run game through the next four frames, as both pitching staffs controlled the plate. However, in the bottom of the sixth, the Mobile BayBears would tie the score when Moyer blasted his fifth homerun of the season over the right field wall to make it 3-3. In the top of the eighth, it looked like the Shuckers would get a chance to retake the lead. Ray led off with a double before Troy Stokes, Jr. walked. That brought Lucas Erceg to the plate. 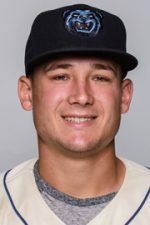 With both runners going on the pitch, Erceg lined the ball down to Thaiss who made the catch, then tagged first before throwing to second for a triple play, the first by the BayBears since 2006. After Biloxi was unable to score in the top of the 10th, Mobile would earn the walk off win in the bottom half of the inning. Using the new international rule, Riley Unroe began the inning at second base. The Shuckers opted to walk Bo Way before Lund sacrificed to move both runners in scoring position. That brought Thaiss to the plate, who hit a ball deep enough into left field to score Unroe and give the Mobile BayBears a 4-3 victory. Greg Mahle (2-0) earned the victory with two scoreless innings of relief. Brennon Lund was 3-5 with a run and a double for Mobile. Hutton Moyer scored 2 runs. Despite taking the loss, Luis Ortiz (1-1) looked incredibly sharp, tossing 6.1 innings, allowing 3 hits and one earned run, while striking out 10. Jake Gatewood was 2-3 with a run, homer, and 2 RBI. Corey Ray continues his hot streak, going 2-5 with a run and a double. These two teams will square off again on Wednesday. Zach Brown (0-0, 4.09) is scheduled to go for the Biloxi Shuckers. First pitch is set for 6:35.